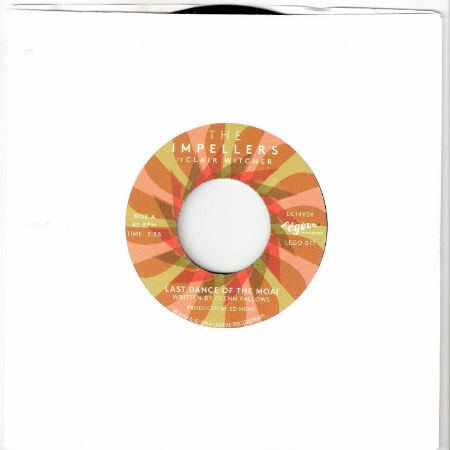 Following the release of their third full-length “My Certainty”, Brighton’s premier funk & soul unit The Impellers launch a new doubler-sider 45 with 2 tracks from the album, accompanied by the video of A side “Last Dance Of The Moai”. “Last Dance of The Moai” was also featured on the band’s debut album “Robot Legs”, but the band felt there was more in it than they had previously gotten: “We started playing it live again recently with a new drummer and bass player and somehow that gave it a whole new life. It went from being a song we never played to being the song we end our live sets with. The new bass groove really brought it back to life. Oh, and it’s kind of a protest song too. The Moai are the big head statues on Easter Island. The song is about us destroying our planet and why that’s probably not a good thing to do”. The B-side, “Veeber” is a great midtempo funk instrumental. Deep and raw as well as thoughtful and skilled. A great party starter with a big beat, great guitar workout, heavy horns and dirty percussion. Or like Glenn Fallows of The Impellers says: “Too much funk written these days is so clean, polished and rehearsed. We wanted something that flies in the face of all that and something that could match any deep funk 45 from the early 70s”.